Mesoamerica, November 29th, 2018 – Juana Ramírez, Dina Puente, Leslie Ann Pamela Montenegro, Juana Raymundo, María Guadalupe Hernández and Guadalupe Campanur are the names of women human rights defenders who have been killed in 2018 in our region for having devoted an important part of their lives towards working for change in their communities and countries. 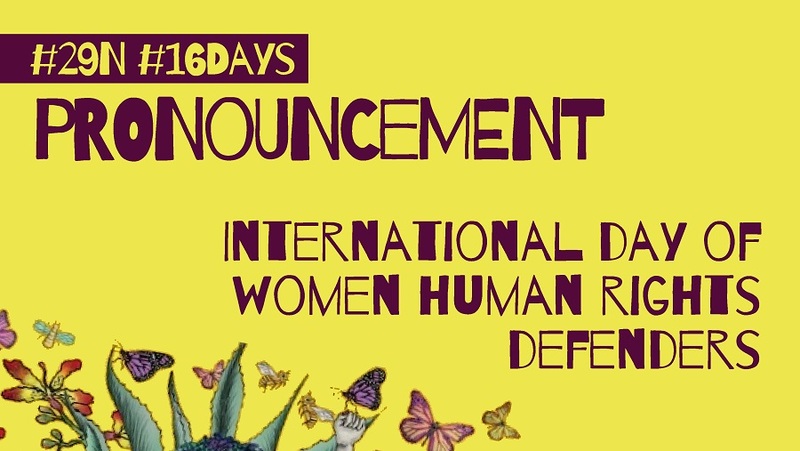 On the International Day of Women Human Rights Defenders we say their names so that their legacy of struggle, hope, and generosity will not fall into oblivion. At the same time, we remember all those women whose deaths and lives continue to be invisible, those whose names don’t appear in registries, newspaper headlines or obituaries. To all of them, we say “Thank you,” and promise that their lives will continue to blossom in the lives of all of us who are keeping on, germinating and cultivating futures. In May of this year we presented our most recent regional report on attacks against women defenders based on data compiled in our 2015-2016 registry system. The numbers speak for themselves: at least 2,197 women defenders were the target of some kind of attack in El Salvador (102), Guatemala (231), Honduras (810), México (862) and Nicaragua (192), which represents a 30% increase over the former period. The defenders of land, territory and natural assets were the most heavily attacked, as part of what seems to be a global trend. Once again, the State appears to be mainly responsible for the aggression: police, military forces, public officials or authorities at different levels of government were identified as the perpetrators in 54% of the cases. Along with the most frequent attacks, such as intimidation and threats, it is alarming to see the systematic use of criminalization as an instrument to punish and inhibit the work of women defenders. This data is in line with the regional context, characterized by the growth of the extraction model; the rise in fundamentalist, anti-rights groups that have an increasingly higher incidence in state policies and public opinion; militarization; social violence and specifically misogynous violence; feminicides and hate crimes; inequality; racism; impunity; and the closure of democratic spaces, as some of the major elements. Far from improving over the past year, this situation has gotten worse, to the extent that in cases such as Honduras and Nicaragua it is truly alarming. Both countries are submerged in a grave human rights crisis whose effects are felt in the entire region according to the testimonies of thousands of Nicaraguans and Hondurans who have been exiled or displaced, as exemplified in the Migrant Caravan now crossing Mexico on the way to the United States border. The impact of this situation on the lives and bodies of women has very specific consequences: the feminization of poverty, feminicides, sexual violence, trafficking networks, criminalization of abortion, political prisoners, exile, stigmatization, and restricted access to truth and justice… This may also be why more women are raising our voices and organizing ourselves to collectively denounce and combat the death policies that stalk our bodies and our territories. We cannot fail to express our repudiation of the farcical trial aimed at consolidating the impunity of the intellectual authors of the political feminicide of our comrade Berta Cáceres and covering up the responsibility of the State in this crime. It is precisely today that a sentence is expected, which in no way means that justice has been done. We cannot stand by in silence in the face of this terrible precedent for the region; it represents a license to kill anyone with impunity who defies policies of terror and death. And so, together with COPINH, Berta’s family, and the comrades in the National Network of Women Human Rights Defenders in Honduras, we continue to raise our voices for #JusticeForBerta. We also know that we are not alone, and last March 8th, the evidence was there for all to see. Millions of women in the world made it clear that this is the time to put an end to centuries of violence, invisibility, renouncement and adherence to the patriarchal order. One part of the current upsurge in symbolic and physical violence against women is a desperate move by a patriarchy that knows it is being cornered with no arguments in its defense. All it has left is its monopoly on violence. Now, more than ever, it is necessary to respond to each attack against us with greater resolve, organization and the conviction that the networks will overcome and that change is possible. And so, because we are conscious of the dangers but also of our strengths in the face of deadly policies intended to keep us alone, isolated and silent, we defenders broaden our collective embrace, lift up our eyes and recognize each other as sisters, builders of futures, cultivators of life… as seeds of change. Today, on November 29th, the International Day of Women Human Rights Defenders, we invite all of you to join us in this recognition and walk together with us along this road.